Sanskrit word Yugal (Sanskrit युगल) literally means pair, couple, double or brace. Yugal founds mention in the Purans (पुराण) and Kavya literature with meanings like a pair or a couple. Yugal is also found to be mentioned in writings of Hemchandra and Halayudh in which Yugal is the name of a prayer of Goddess Lakshmi and Narayana. Reference of Yugal is found in Panchtantra (पञ्चतन्त्र) where Yugal denotes as brace. Yugal is not a popular name in the USA. 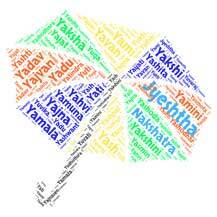 Yugal is a somewhat popular name in India. As per social media, Yugal is used by less than 325 people in India as the name of their babies. In our opinion Yugal is a unique name. Yugal is also a short and sweet name. Yugal also has some mythological significance attached to it. According to mythology, the girl Manja (originally Sanskrit)..
Sanskrit name Mantha (मन्था) literally means churning or agi..
Sanskrit name Esh (Sanskrit: ऐश) literally means supreme or ..
Sanskrit Gana means tribe, group, multitude or gang. Gana i..
Sanskrit boy name Dhyan (ध्यान) means attention, appreciate,..